God made you special and loves you very much. Catholic guilt. Some of you know exactly what I am talking about. Some of you may be carrying around some of it yourself. What exactly is Catholic guilt? I am not exactly certain to be honest, but I will define it as any feeling of guilt that comes from a thought, action, or inaction that a part of yourself perceives to be wrong and can somehow be traced to a Catholic teaching, either spoken or implied. Fear-based teachings have this sort of effect on people, ya know?! Boo! Anyway, I have been meaning to write this post for quite some time. The thoughts I am about to share make me both laugh and scratch my head. The photo above was taken of a statue of Saint Joseph holding baby Jesus in his arms standing next to Bob the Tomato. If you look closely you will see that Jesus is missing his head. It was a freak stair-diving accident involving a few rowdy preschoolers and this statue. I am not sure if there was a parachute involved, but either way this was the end result. Almost four years after the accident, I realized that the statue was still sitting atop my refrigerator, headless and all. Why was it still there? Two words: Catholic guilt. OK, maybe not exactly guilt, perhaps it was the old dead Catholic in me that somehow felt fearful of the repercussions for having decapitated Jesus in my home. My Catholic friends may not think this is funny. At all. Honestly, I am not even sure I should think it is funny. I start to laugh, because after all this plastic statue was manufactured in China, no doubt using dubious labor practices. The statue says clearly, "Made in China" not made in heaven. So, it is just plastic right? To most of us yes. To my adult self and beliefs, mostly yes...but also no. If my answer was truly yes, this broken statue would have been in the trash four years ago, right? What was it that I have have learned seemingly a lifetime ago to make me think that a broken statue is in any way, shape, or form related to harming Jesus? You and I are supposed to be Jesus' hands and feet and a statue is just, well...a statue. The statue cannot grow the kingdom or love a neighbor so why is so much emphasis placed on images and statues in the Catholic Church? It has been seventeen years (yikes!) since I have been part of the Catholic Church. You would think their laws and rules would have no effect on me at this point. There is something about the Catholic church that gets into your head and is nearly impossible to completely dispose of. Even when you don't believe it and don't practice it. In all practical matters, Catholic teachings do not impact or guide me. However, this statue has come to represent a bridge of sorts for me. It was also a gift from my mom and I know she would laugh and shake her head if she knew it was still sitting in our kitchen. "Oh, just go bury it", she would say. The statue causes me to stop and reflect: reflect on where I came from, where I have been, where I am going, and how God may be able to use all past experiences to live out my life's purpose for his glory. Currently in Seminary, I find it incredibly healing to go back and reexamine my old beliefs, to discover where they may have come from, to toss what I perceive to be useless, and hold on to anything that represents Jesus' heart. It is all part of the journey. And it is good! "We should give to relics, crucifixes and holy pictures a relative honour, as they relate to Christ and his saints and are memorials of them." "We do not pray to relics or images, for they can neither see nor hear nor help us." So, would Saint Joseph's stair-diving accident be considered inappropriate or profane? Nah...I'm sure stair-diving was not a popular sport during his time, so maybe he just wanted a quick adrenaline rush? Seriously though, my answer to this is that a statue or treatment of a statue is so extremely trivial in comparison to the way we treat each other. Jesus said, love God with all that we've got and love our neighbor as ourselves. If I had to guess, Jesus wouldn't give a lick about statues and might even caution against them. For me, anything that distracts or takes away of loving another real person is reason to pause and reflect. As for my broken statue, I am going to keep it for the time being. I might eventually "return it to nature" as the Catholic Church suggests, meaning to bury or burn it. Either way, it is just a statue. What is represents to me is memories of times past and hope for what is ahead. So, if you visit my home and wonder why a headless baby Jesus in atop my refrigerator, now you know. As for my personal beliefs about images, statues, and the like, they align with Paul in the book of Romans (1:25) when he says, "They exchanged the truth about God for a lie, and worshiped and served created things rather than the Creator—who is forever praised. Amen." 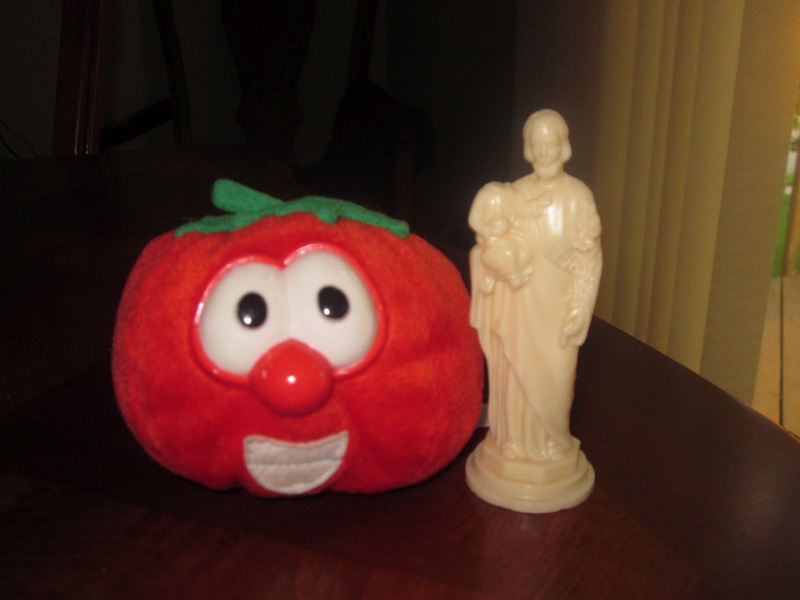 And, as Bob the Tomato tells us, "God made you special and loves you very much." The official Catholic position on images, which holds through this day, was given at the Council of Trent in 1543 states, "The holy Synod commands that images of Christ, the Virgin Mother of God, and other saints are to be held and kept especially in churches, that due honour and reverence are to be paid to them, not that any divinity or power is thought to be in them for the sake of which they may be worshipped, or that anything can be asked of them, or that any trust may be put in the images, as was done by the heathen who put their trust in their idols, but because the honour shown to them is referred to the prototypes which they represent, so that by kissing, uncovering to, kneeling before images we adore Christ and honour the saints whose likeness the bear."